Have you ever admired sunshine coming through your front window, then you look through the beams of light only to see 100's of thousands of particles floating in the air? Yikes! And to think, you are breathing in all of that dust, pollen, dander, and allergens... but you don't have to. 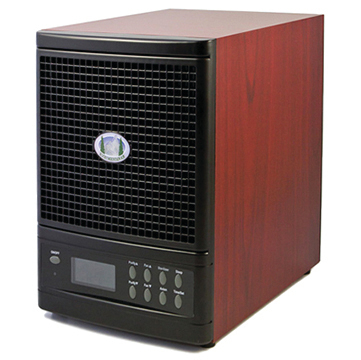 With the Summit Air Purifier, these contaminates will drop right out of the air. As soon as you turn on the ANION feature, the ionic air purifier goes to work utilizing ionization technology to make particles in the air heavy, and dropping them out of the air you are breathing. Reduced particulates means reduced triggers for sinus and allergy sufferers. The simplified science behind the ANION feature is this... Dust, pollen, dander, and allergens are negatively charged which attach to positively charged ions and become heavier than the air and tumble down to the ground. This ANION feature helps to "pre-clean" the air before it even has a chance to be drawn through the ionizer. Decreasing the dust, pollen, dander, and allergens also keeps your Pre-filter and HEPA filter cleaner longer, and allows the filters to be more effective by concentrating on the and small-sized particles. All of our stages of filtration work together to provide the maximum filtration benefit.